"I just invented the hot new time-waster of the summer: Google Street Racing. It works using the much talked-about Google Street View. 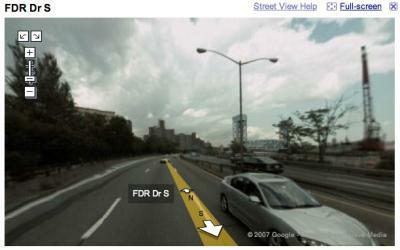 As you may know, the new Google Maps feature was created by using a 360 degree camera mounted on a VW Beetle. That means that if you follow the directional arrows on the Street View images, you're really just following the path of a car. And that means that the cars you see on the road with you are travelling at roughly the same speed. And that means: drag racing! "To play Google Street Racing, you'll need to pick a long straight road, preferably with few exits, and start near one end of it. Hunt around a bit until you're directly alongside another car. Then start clicking the directional arrow over and over and over again. Make vroom-vroom noises while you do it, so it doesn't seem quite as boring. As you gain or lose ground, you may need to use the swivel arrows to keep your competitor in view, but unless he gets off the road, you should be able to follow him for a good long time. "In my first attempt, I raced the sporty silver sedan above down the FDR drive. I started alongside him at 133rd Street, pulled ahead at 129th and then fell into the rear around 125th before eventually losing sight of him altogether around 110th. I'm sure I can do better next time. Surely I can out run a Mini Cooper, right? "And, yes, I did check to make sure no one had thought of this before. All I found was some pipe dreamer who missed the existing opportunity right in front of him."